Originally developed as in-ear monitors for pro touring musicians, Shure Sound Isolating earphones seal into your ears like earplugs, blocking up to 37 dB of ambient noise and enveloping you in transparent, accurate sound. To create their Wireless Sound Isolating earphones, Shure added a Bluetooth communication cable to their most popular SE earphones. Shure's wireless versions of the SE112, SE215, SE425, SE535, and SE846 give you the freedom of Bluetooth audio streaming from your smartphone, tablet or laptop -- with the pristine sound, great isolation, and comfort you expect from Shure. 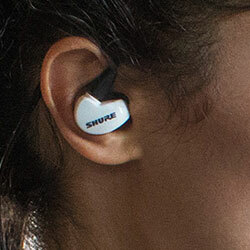 Read on to compare Shure's wireless earphones! Shure's wireless earphones are built around a Bluetooth-enabled communication cable with a tiny, lightweight battery that lasts for 8 hours of playback time -- rechargeable with the micro-USB cable included in the package. You can wear the cable around the front of your neck for easy access to the built-in mic -- or wear it around the back to keep it out of the way. The cable's in-line 3-button remote control lets you power on your earphones, play/pause/skip tracks and control volume, and the in-line microphone lets you easily take calls or make voice commands without reaching for your phone. Your smartphone, tablet and laptop can stream Bluetooth audio up to 30 feet to your Shure Wireless Sound Isolating earphones -- great for your workout, commute, or desk. 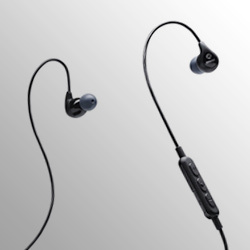 Shure's most affordable Bluetooth earphones model, the SE112 Wireless earphones offer a frequency range of 25 Hz - 17 kHz with the flat, accurate response that Shure SE in-ear headphones are known for. Your SE112 earphones come with 3 sizes of flex sleeves to help you fit them perfectly to your ears. Unlike other Shure SE earphones, the SE112's in-ear drivers are not removable from the cable, and they can be worn either over-the-ear or hanging straight down -- either way, you'll get a secure, comfortable fit and impressive sound that's sure to be a serious upgrade from those one-size-fits-all earbuds that came with your device. Step up to Shure's SE215 Wireless earphones, and you'll get a wider frequency response of 22 Hz to 17.5 kHz for detailed sound, a comfortable over-the-ear design that's exactly like the in-ear monitors that pro musicians wear on stage, and an expanded Fit Kit with 3 sizes of flex sleeves and 3 sizes of earplug-style foam sleeves so you can customize your pair for a personalized fit. Wireform behind-the-ear cables stay out of the way, while keeping your earphones securely in your ears. 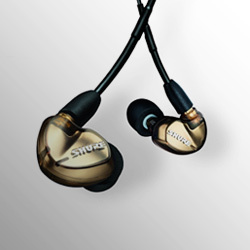 The Shure SE215 model comes with gold-plated MMCX connectors on each earphone. These locking connectors snap into place, then rotate 360 degrees for comfort. MMCX connectors are standard for Shure earphones (and more earphone and in-ear monitor brands, too!) so you can easily swap in a wired MMCX cable to connect to an IEM system, or swap a new pair of earphone drivers onto your Bluetooth cable. 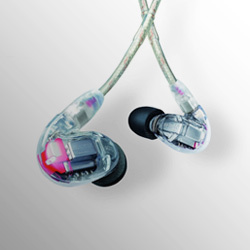 This modular design makes Shure SE215s totally pro-level! Moving up from a set of stock smartphone earbuds to Shure SE425-BT1s is going to feel like a quantum leap in terms of audio fidelity and build quality. The dedicated tweeter and woofer housed in each earbud make for a more complete stereo picture -- Shure designed these to provide accurate monitoring for musicians on stage, so you can be sure you're hearing your favorite songs as the artists intended. Included are three types of sound-isolating sleeves that help shut out unwanted noise, getting you closer to the music. Whether you're using the wired cable or included BT-1 Bluetooth cable, you'll be able to adjust volume, pause and play music, and make calls via the on-board remote! Step up to Shure SE535-BT1 headphones and enjoy the incredible spacious soundstage created by its three high-definition drivers. You'll be amazed at how full of a sound you hear from these compact earbuds. These in-ears feature an over-the-ear hook design meant to stay secure for musicians on stage, but it also works to keep your earbuds in place when you're listening to music on the go or at the gym. Detachable connectors make it easy to replace your cable if it goes out, or to switch between wired and wireless Bluetooth connectivity -- both cable types are included and come standard with in-line mic and control. When you need absolutely premium sound in your wireless earbuds, look no further than a pair of Shure SE846 in-ears. 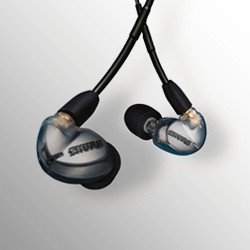 These top-shelf in-ear monitors are thoroughly fine-tuned by Shure engineers and feature innovative components like an integrated low-pass filter, allowing for subwoofer-grade lows while mids and highs remain completely clear. You can even customize these monitors' frequency response via changeable nozzle inserts. SE846s are also made to fit right, with ergonomic, flexible over-ear wire and a full selection of eartips in different sizes and different isolation levels. Enjoy premium sound, plugged in or wireless, with Shure SE846-BT1 in-ears. Do you already have a pair of Shure SE earphones with detachable cables? 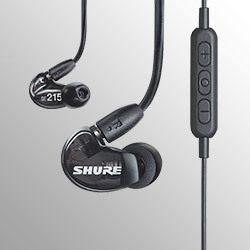 If you happen to own a pair of Shure SE215, SE315, SE425, SE535 or SE846 earphones with MMCX connectors, you can easily turn them into Bluetooth earphones just by adding Shure's Bluetooth accessory cable. 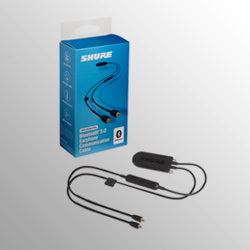 Just unlock the old cable from each earphone driver, and snap on the Shure RMCE-BT1 Bluetooth communication cable to turn your wired earphones into wireless earphones. Just like Shure's Bluetooth earphone models, the RMCE-BT1 cable provides 8 hours of audio playback on a single charge via its rechargeable lithium polymer battery, and a 3-button remote and in-line mic to control music playback and calls. It's the perfect upgrade if you've already got Shure SE earphones that you love! 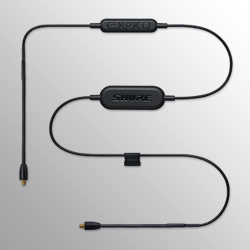 Shure's next-generation Bluetooth wireless receiver cable, the RMCE-BT2, is packed with high-end tech for audiophile-quality sound and lower latency, compared with the original BT1. • Battery life of up to 10 hours. Add the RMCE-BT2 cable to your Shure earphones, and hear the difference!